Kagami Beraki. Taiheiyo and Cebu officials break the saki barrel in a traditional Japanese rites during the recent inauguration of the P633 million eighth cement grinding finish mill at the plant in San Fernando, Cebu. They are, from left: TCPI CEO Satoshi Asami, TCC president Shuji Fukuda, Japanese consul for Cebu Shigeyuki Hirakawa, San Fernando Mayor Antonio “Abe” Canoy, Cebu Gov. Hilario Davide III and TCPI chairman Ken Kikuchi. SAN FERNANDO, Cebu (Dec. 14, 2015) — A Japanese-run cement manufacturer based and operating here has assured stakeholders it can readily source out additional clinker should demand for finish-milled cement further escalates. Taiheiyo Cement Philippines, Inc. (TCPI) can immediately import needed clinker from various cement plants owned, affiliated and operated by Taiheiyo Cement Corp. (TCC) of Japan, assured TCPI CEO Satoshi Asami. 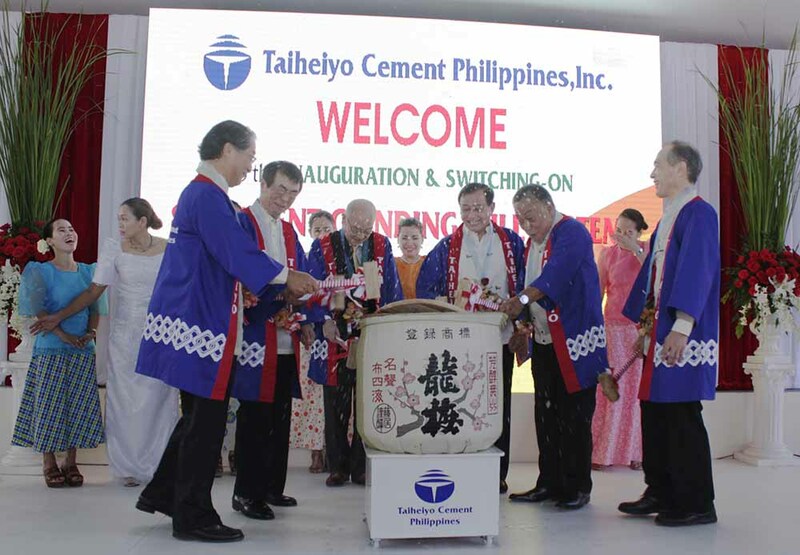 “We, in the Taiheiyo Cement Group, have a stronger trading network and (reliable) supply chain in East Asia, compared with the other multi-national cement manufacturers in Philippines,” he declared. “It is a very big advantage that TCPI has many export-ready cement plants (run by) our sister companies in Japan, Korea, China, and Vietnam,” he said during the recent inauguration of TCPI’s new finish mill. “I believe this total international supply-chain makes the new cement supply capacity of TCPI more stable and more reliable,” he pointed out. Kikuchi said Taiheiyo Cement Corporation (TCC) of Japan believes that the Philippines “shows promise in terms of future growth,” reason for the substantial investments the group has poured in Cebu. 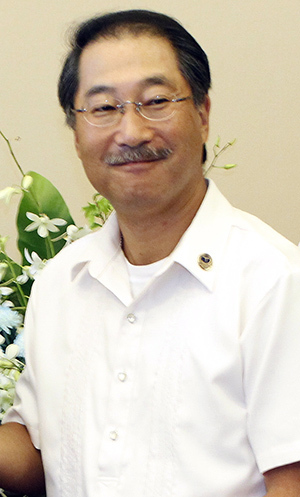 TCC president Shuji Fukuda personally switched the ceremonial button on for the eight cement grinding finish mill, an investment of P663 million, to start full commercial operations in San Fernando, Cebu. The 8th and new cement grinding mill of TCPI in San Fernando is housed here. This facility has increased the capacity of TCPI to produce one million tons of cement more in a year, up from only 1.4 million tons, making TCPI meet no less than nine percent of the country’s demand for cement by 2016. This now allows TCPI to now produce five million bags every month of Grand Portland, Grand Pozzolam, Grand Premium and Grand Masonry cement for Cebu and the rest of central Philippines. These Taiheiyo products have been noted for better stability of compression strength in the market, making these good for making stable quality concrete, especially for high-concrete projects, noted Asami. The new finish mill came after Taiheiyo group invested P270 million to double the capacity of its port facilities, plus more by building a new clinker shed, a 4,000-ton cement silo, two additional packers, and upgraded the pre-cement grinding system. “Through these, we envision to contribute more to the cement industry of the country by producing and providing stable supply; and thereby, be able to consistently support the construction activities of both the private and public sectors,” said Kikuchi. “Along with creating more economic opportunities, it is our objective, to continue to contribute to the improvements of the lives of the Filipinos, through infrastructure and social development,” he added. He said TCPI is an important foothold in Taiheiyo’s overseas operations. “As we continue to pursue, our aim of worldwide development and expansions, we foresee your country as one of the important emerging countries in this growing Asia,” declared Kikuchi. This entry was posted on December 14, 2015 by Cerwin in Taiheiyo Cement and tagged cement, clinker, East Asia, economy, finish mill, Grand Masonry, Grand Portland, Grand Pozzolam, Grand Premium, grinding system, infrastructure, investment, Japan, Kagami Beraki, saki, San Fernando, social development, Taiheiyo, TCPI.